Happy Wednesday, peeps! I realized I was falling behind on my Christmas card stamping, so I checked out a couple of challenges and went to work! 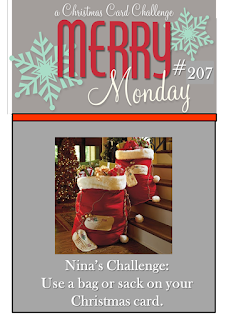 The Merry Monday challenge this week is Santa's sack, and the Stamp Ink Paper challenge has a wonderful sketch! Another one added to the stash! Cassidy found some tiny wild strawberries growing in the yard and thought they would be fun to pick for her baby dolls! They're cute, but NOT very tasty! Enjoy your day! Super fun creation LeAnne! :) I just love the layout and the Christmas bingo behind silhouette Santa!! Super cute design! We have been getting some nice strawberries in our garden if we can keep those squirrels out of them!! LOL!! Wow LeAnne, LOVE your beautifully designed Christmas cards! I may even have to try to get my hands on those awesome pine bough dies! Thanks so much for joining us at Stamp, Ink, Paper for our sketch challenge this week! Love your Santa and how you've stamped the sleigh and reindeer in the background! Thanks for sharing with us at Merry Monday! Always love to see you in the gallery! Gorgeous vintage Santa - love him in the red ink! So great with the bingo paper and sleigh/reindeer behind! I like the mix of patterns and the little pine sprigs! This is beautiful LeAnne. I didn't know there were strawberries that tiny!! Too bad they don't taste good, think how many you could eat LOL!!! Beautiful card!! I always mean to get a jump start on Christmas cards, but I never seem to.....this inspires me, though!! I love all the details to your card, and the mix of papers you used. Just beautiful!! Thank you for joining us at Stamp, Ink, Paper!! That's a really pretty card! I love the traditional colours! And your little girl is gorgeous too! Oh boy, you're a whiz with patterned paper. The way you've layered it to showcase Santa and his bag is terrific. Especially love that you included the sleigh and reindeer...perfect touch. Wonderful card Leanne, I love the layout and your silhouette Santa. Thank you for joining us for Merry Monday. Great vintage feel to your card LeAnne, love the Santa image. Thanks for playing at Merry Monday. Great Christmas card! Thanks for playing along with the Stamp Ink Paper challenge! Love your card! Even though I can't even think about Christmas right now, I love what you've created! Thanks so much for joining us at Stamp Ink Paper Challenge this week! Very nice nostalgic feel to your card, love all the details! Yummy... strawberries, wish I was one of her Baby Dolls! Hi LeAnne, I love the colours you have used. The santa stamp is a lovely vintage santa and I like the slightly distressed papers too.